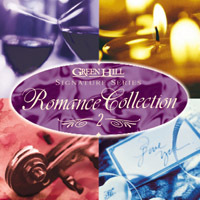 Romance Collection 2 features 12 stand out performances from best selling Green Hill romantic titles. Covering a wide variety of styles including light jazz, big band, solo piano, orchestral, and more, this elegant compilation is the perfect accent to any romantic evening. Available as a compact disc or cassette ($9.95). Please indicate your preference when ordering. If ordering the cassette, the price will be adjusted upon receipt of your order but will not be shown on your program-generated receipt.